Learn all about the bay and its incredible wildlife in the Barnegat Bay Master Naturalist course and share what you're learned with others! Do you enjoy learning about the plants, animals, ecology, and traditions of the Barnegat Bay and its watershed? Do you like sharing what you’ve learned with others? Then consider becoming a Barnegat Bay Volunteer Master Naturalist! The Barnegat Bay Partnership, through the Ocean County College Continuing Professional Education Department, offers a program to train Barnegat Bay Volunteer Master Naturalists (BBVMNs). Participants learn not only about the wildlife and natural resources of the estuary, but also about the latest scientific research and the challenges ahead. The program includes training in the skills volunteers need to help educate others about the bay and about good stewardship of its valuable resources. This program is based on a national model. The BBVMN training course, offered through Ocean County College, consists of both classroom and field-based learning experiences about a wide range of natural resource and wildlife topics specific to the Barnegat Bay and its watershed. Register now for the next BBVMN course (# CEBS-137-01), offered in April and May of 2019 by the Ocean County College Continuing Professional Education Department. The instructor is Ms. Becky Laboy, an experienced naturalist and educator who has a BS in Biology and a Masters in Education. 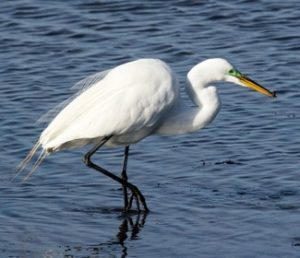 The course will focus on the wildlife and natural resources of the Barnegat Bay watershed and include training in interpretive techniques. Topics will include Barnegat Bay fishes, shellfishes, and crustaceans; salt marshes and seagrasses; water monitoring; birds and other animals of the watershed; native plant identification; forest resources; soil health; Pinelands ecology; and Barnegat Bay history, culture, and traditions. During the Saturday field trips, participants will explore the forests, marshes, streams, and shorelines of state and county parks throughout Ocean County — hiking, kayaking, seining, photographing, and learning from experienced master naturalists, environmental educators, and field ecologists. You will meet at various locations for the Saturday trips. After registering, you will receive a detailed schedule of session topics and locations. See page 3 of the Spring 2019 catalog for course details and pages 7 and 54 for registration information. You can register by phone at 732-255-0409, in person at the Ocean County College Library Building #3, or by mail at Continuing & Professional Education CPE, Ocean County College, PO Box 2001, Toms River, NJ 08754-2001. If you have taken courses at OCC in the past, you can register online. 2019 course dates are April 3 to May 22, 2019. There will be a total of 9 sessions. Dates: April 3, May 8, and May 22 Time: 7:00 p.m. to 9:00 p.m. Date: April 17 Time: 3:30 p.m. to 7:30 p.m. Dates: April 6, 13, and 27; May 4 and 18 Time: 9:00 a.m. to 3:00 p.m.
We are also offering 2 optional Saturday field experience sessions. These extra sessions offer an opportunity to make up a missed session or just learn more. Completing the BBVMN course is the first step toward certification. To receive the BBVMN certificate, participants need to complete 40 hours of approved environmental service at sites within the Barnegat Bay watershed within a year of finishing the initial training course. To maintain certification, BBVMNs must complete 40 service hours plus 8 hours of advanced environmental training each calendar year. Visit the BBP Master Naturalist Facebook page for volunteer opportunities shared by the Barnegat Bay Volunteer Master Naturalists. ASSIST WITH SCIENTIFIC RESEARCH: BBVMNs do not hesitate to get their feet wet and their hands dirty. They have assisted with seining and recording data during Barnegat Bay Partnership sea nettle research, with assembling American eel collectors, and with dune grass planting and trail maintenance at Island Beach State Park. GIVE BACK THROUGH STEWARDSHIP: BBVMNs help with stewardship projects, such as dune grass plantings and trail maintenance at Island Beach State Park. ASSIST WITH PUBLIC OUTREACH: BBVMNs have staffed exhibits at environmental festivals and events around the watershed, such as Ocean Fun Days and Cattus Island Nature Day. DESIGN DISPLAYS: BBVMNs have flexed their creative muscles and designed displays to educate others about the natural resources of the estuary.